While Eugene Standingbear was in the closing chapter of his life in the 1970s, I was wrapping up my military service, which included 3 years in and around Vietnam. Getting my walking papers in Seattle in January 1973, I moved back to Colorado, finished college, and spent some time helping my folks put out a small-town weekly newspaper in Keenesburg. I worked on several newspapers for a while, writing feature stories. The best stories were about an old, reclusive Lakota artist then living in Keenesburg known to many of the townfolk as “Gene,” or “Chief”… the subject of this series of articles. saved the life of a beautiful 21-year-old girl, apparently on drugs, who “wanted to experience the power of the ocean” by wandering out into the surf at Carmel by the Sea, wearing a flowing, black chiffon dress, and nearly drowned. Mostly, though, the wine, the sickness, the living hell for the living dead… all were part of the winos’ world in which society seemed like a hazy dream world moving strangely around them. At first, Eugene was too sick even to think about getting his life back. The doctor had told him that drinking one more ounce of alcohol would probably kill him. His kidneys, liver, and spleen were irreparably damaged, and painful ulcers plagued much of his digestive tract. Even if he never again touched another drop of liquor, the doctor promised that he’d be dead within two years. His body was just too broken to survive. Julian Pokrywka was the husband of Eugene’s niece Frances, who was born when Eugene was 19 years old and who died of alcoholism shortly before Eugene landed in the hospital (April 1960). Of Polish descent, Julian was developing ties to the Lakota people. He’d loved Frances deeply and had seen first-hand the ravages of alcoholism that had taken her life. Maybe he could now help her Uncle Eugene get back on his feet in a quiet town out on the prairie. 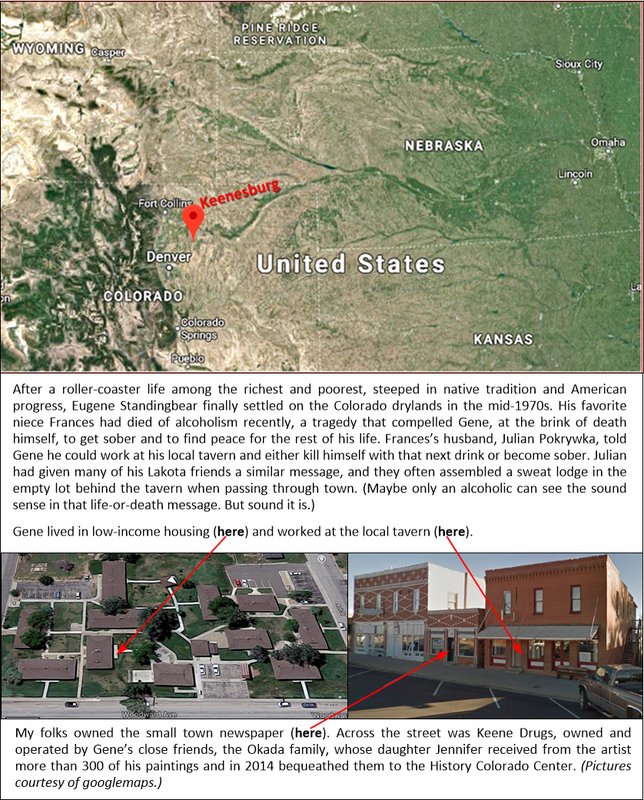 So before long Eugene was in Keenesburg, Colorado, the gateway to the Eastern Colorado drylands, where Julian owned a café and tavern. Eugene’s job would be tending bar, and he could play honky-tonk music on the out-of-tune piano whenever he wanted to. Julian swept his hand past the whiskey bottles lined up behind the bar. “Here you are, Eugene, all the whiskey you could ever want. You can either drink yourself to death or make a clean break. Your life’s in your own hands now.” But by now the very thought of drinking alcohol made Eugene sick and shaky. So after a decade on skid row, struggling to survive among other winos, Eugene was now tending bar and didn’t taste a drop of alcohol. He was receiving more liquor than he could ever have wanted… signing for it whenever it was shipped from the various supply warehouses in Denver. He played piano, got to know the locals, and gradually regained his strength. Julian would later marry Lakota activist Theda Rose Nelson, and his tavern in Keenesburg would become a sort of way station for activists in the American Indian Movement (AIM) as they drove across country in the 1970s. Through it all, Eugene’s niece Frances would always be the love of Julian’s life, and the two would eventually be reunited in adjacent plots at Fort Logan National Cemetery in Denver. Are Julian and Frances still together in the worlds of spirit? Your guess is as good as mine… but I wouldn’t be surprised if (based on what I know about the afterlife) they and Eugene and his family and many of the other good people mentioned in these articles cross paths during their journeys in paradise from time to time and tell stories of the dramas they endured during their lifetimes on Earth. 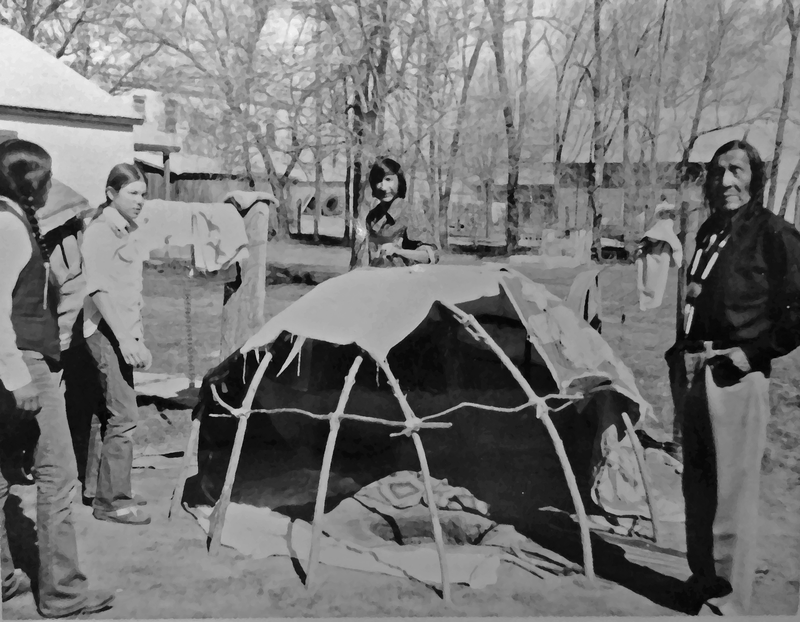 Nearly every summer in the late 1960s Eugene would hitch up his trailer loaded down with teepee poles and drive to the pow wow in the Kyle district at Pine Ridge. In the 1970s, though, he took a few years off because of all the trouble being stirred up on the reservation by the AIM activists. When he voiced his concerns that the young people were getting too angry and forgetting their traditions, they’d sometimes call him “Uncle Tomahawk” and accuse him of being too passive toward the affronts of the white man. With sobriety and old age, Eugene had become patient and was beginning to see slow, positive changes in society… more awareness of Native Americans, their strengths, their problems, and the tragedies they’ve had to face during the past two centuries. To Eugene it seemed inevitable that the Native American spirit, having been a part of the American land for so many thousands of years, would never die. Gradually it would sprout in the fertile soil of American society to flourish like a native plant, spreading the noble values of generosity, simplicity of life, patience, detachment from material things, respect and good will for others, and a reverence of nature. Eugene had always been considered by friends and family to be a gifted young man. He was one of the best athletes and dancers on the reservation. He enjoyed a good fight and good, hard work. He risked his life for the good of his people, spending severe winter days hauling supplies with horse and wagon from the railroad town of Wall, South Dakota, to a Pine Ridge community called Red Rock. He’d frequently have to dismount, cup his hands over the horse’s nostrils, and blow warm air to melt the icicles that were blocking the horse’s breathing. During a subzero blizzard one Christmas Eve on Pine Ridge, while riding home from town, he stopped to warm up at a neighbor’s house where a Christmas party was going on. Eugene was welcomed and invited to join the party. As it turned out, he organized the entire evening, setting topics for a series of Christmas lectures by three Christian missionaries in attendance, preparing a gift-giving ceremony in which he dressed up like an Indian Santa Claus in burlap and bells, and initiating an all-night dance. He slept for two hours before heading home the following morning. For better or worse, Eugene strayed from his native roots through most of his life and found his way in the new America, despite many obstacles. Funny how life works out…. Had he been embraced as “Chief” among his people, as many expected, he might have been revered as a leader who brought good changes. Instead he followed his restless spirit and was simply accepted as “Eugene” during his visits home. Had he been welcomed as “Eugene” in the cities and companies where he lived and worked, he might have felt at home, and his skills and charms could have made the country a better place. 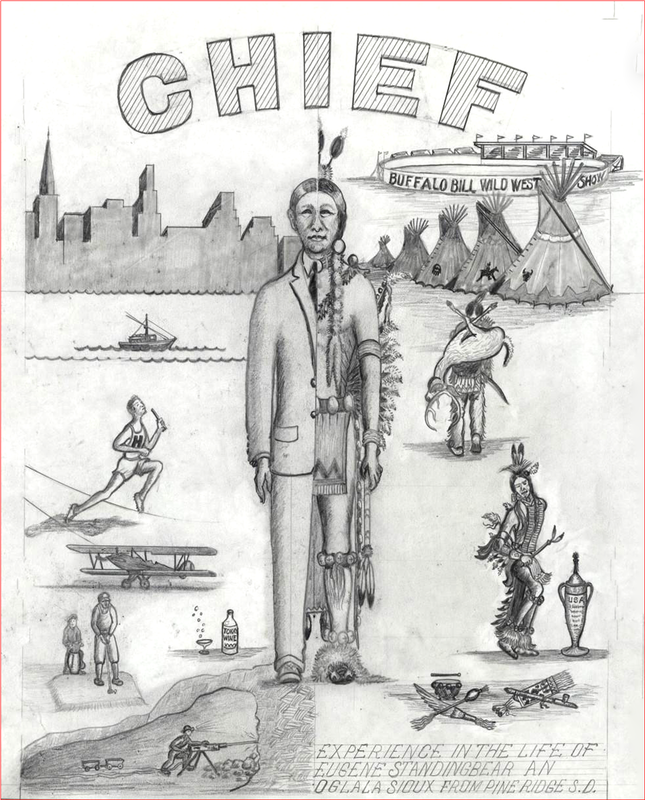 Instead he was usually addressed, with some ambivalence, as “Chief.,” making him feel shunned… an outsider. 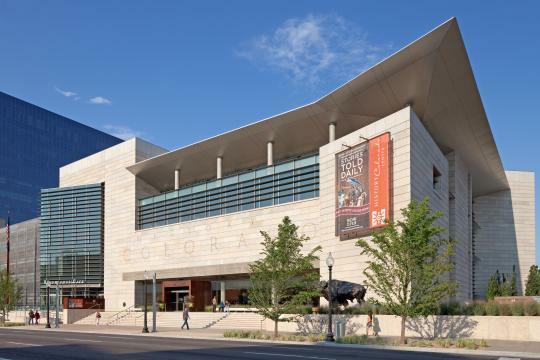 So he was certainly caught between two worlds… as described by Alisa Zahler, author and curator at the History Colorado Center museum in Denver. In the fall of 2014 she and the Center hosted a brilliant tribute to Eugene, sharing a lot of his artwork and biographical information with the public as part of a traveling exhibit called RACE: Are We So Different? Jennifer Okada of Keenesburg had become a close friend of Eugene during his final years, and he had given her more than 300 of his drawings… which she in turn donated to History Colorado… where Eugene Standingbear’s legacy lives on today. Thanks for this series on Standing Bear, Mark. You are the main historian of his life. His life evokes compassion for all of us.